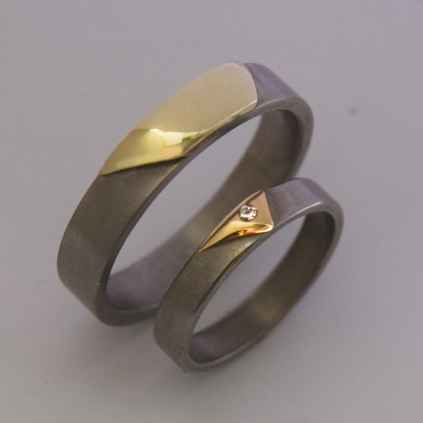 Materials: Matte titanium wedding rings mounted (appliquéd) with two unequal, complementary halves of a scalene triangle of 14K gold; the ladies' ring is set with a white 0.025 ct V.V.S.I.-G-2-2)-422 brilliant-cut diamond. Two stylized sand dunes made of 14K gold against a contrasting gray background of matte titanium are the design features in this unique wedding ring set. The minimalistic design of the wedding bands portrays the still dynamics of the sandy shores and magical dune formations and islands of Lake Michigan. Both design and colors are inspired on two legendary islands that lie in nibegomowini-wiikwed, "bay where one waits in the night in the water for game", which is part of the Sleeping Bear Dunes National Lakeshore situated along the northeastern coastline of Mishigami, or Ininwewi-gichigami (Lake Michigan). These islands, covered with lovely rolling and sparkling white sand dunes rich with beech, oak, maple, white pine, and giant white cedar trees, were named manidoo-minis (spirit island) and manidoo-minisens (small spirit island) by the original Peoples who lived in the forests beyond the dunes. The islands are silent reminders of a beautiful traditional Anishinaabe story named "The sacred tale Of The Sleeping Bear Dunes", through which the formation of the dunes and Manitou Islands was explained. Both designs of highly polished yellow gold, which the jeweler riveted to the titanium ring shanks, have complementary forms. The stylized dune of the ladies’ ring features a brilliant-cut white diamond representing essential marital virtues: dedication, steadfast love and life-long encouragement. Go to our art blog to read the Anishinaabe aadizookaan (Ojibwe sacred story) of Sleeping Bear And Her Children.